Like so many things in life that are familiar to us all, the NBC Chimes are known by everyone, but surrounded by myth and legend, some of it true, some of it with no basis in fact. Another Urban Legend has grown over the use of a fourth chime; that it is used as a sort of emergency alert. Although it has been used that way, the original purpose of the Fourth Chime, according to an NBC Interdepartmental Correspondence dated Apr 7, 1933, was nearer to a modern pager. “In anticipation of the Spring and Summer months, when many in key positions will not always be available at home telephones, the following Emergency Call System will go into effect…” The memo went on to state personnel on an attached list were to contact the network operator when the four chimes were played. The list included NBC executives as well as members of the Engineering, Press, and Service departments. The four chimes would be played every fifteen minutes over WEAF and WJZ until the desired party contacted the network operator. 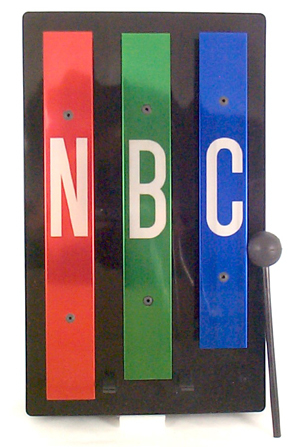 The last time the fourth chime was used was to signify the merger of NBC with GE in 1985. This entry was posted in NBC Chimes, Old Time Radio, Urban Legend and tagged NBC Chimes, Radio History. Bookmark the permalink.